Today’s family is always on the go, and communication can be tough. Even if you have only yourself to worry about and organize, a calendar and marker board can help keep track of important bills, reminders and notes in general. If you are running a business, a marker board can be a handy place to announce specials, write up menus or to give directions to workers. A reusable calendar board can be a handy way to keep everyone on the same page. If everyone writes their appointments, work schedule and other important dates on the calendar, it will be easier to schedule transportation and to iron out conflicts. It can be a real challenge sometimes to get everyone to where they need to be on time. It seems as if every home has a snowstorm of paper. Notes from school, notes from work, bills to pay, and more. You can use either a magnet board or an old-fashion pinboard to keep those important papers in a location where they don’t shuffle under the armoire or into the kitty litter box (ew!). A combination bulletin board, dry erase board and letter holder can make life a whole lot easier whether you are a household of one or one hundred and one. The kind of decorative dry erase board that will work best for you depends upon your household or business size, who is going to be using it, and the kind of things that you need to write on it. Calendars are great for scheduling, for example, but a blank board is better for writing down menus, chore lists, or rules. And don’t forget to have one or two just fun little boards that you can use to display artworks or a friendly message for when someone is having a rough day. 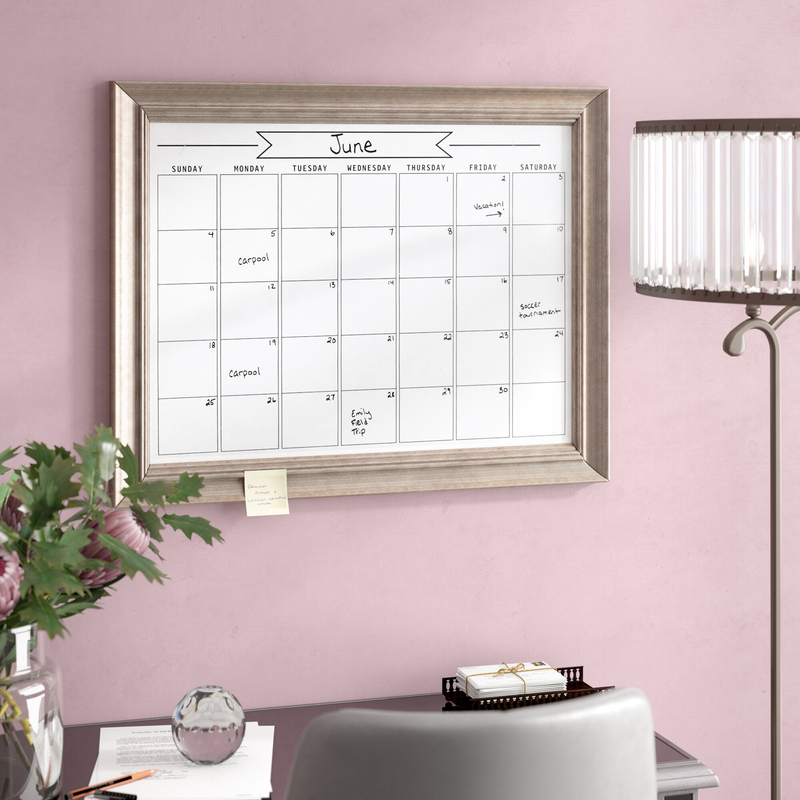 Keep the family or household organized with a wall-mounted dry erase calendar from House of Hampton. The large squares provide plenty of room for schedules, events and reminders to be posted. Hanging hardware, preinstalled on the back, comes with four magnets for attaching important notes. Stylish frame takes this beyond the old dormitory note board. Write up menus, announce events or just celebrate the day with this barnwood framed dry erase board from Rayne Mirrors. Encourage shout-outs and more with a plain dry erase board, that is ready to frame any message you desire, and perhaps even a few you don’t. The perfect entry-way announcement board for your home or business. Stylish announcement board with hand-crafted silver frame. Imagine this one in the lobby of a theatre or auditorium – just waiting to announce the next show. Or it could be in your entryway at home, displaying simple messages such as “gone out for sushi – back soon.” Whatever the use, this bright message board will enhance your communication. Perfect for LAN parties or sleepovers, this chic, black-framed board announces: “the wifi password is _______________,” with space for you to write in that esoteric string of letters and numbers for your wireless network. No more handing around a paper that is hard to read or copy. Arrives ready to hang, all hardware included. Communicate important observations or the next dental appointment on this glass message board. Beneath the glass is the subtle hint: write on, wipe off, mimicking the quote “Wax on, wax off,” from Karate Kid. When no messages are needed, the clear glass displays the tongue in cheek misquote against a soft, patterned background. Frame your messages in style with this French Victorian framed dry erase board. The handcrafted frame gives a sense of unique class to an ordinary whiteboard. You almost feel as if you should do a drawing of Marie Antionette on it, or add lacy notes with little heart magnets. Comes with all necessary hardware for hanging. Is it a bulletin board, a magnet board or a work of art? The octagonal magnetic bulletin board is perfect for displaying photos, tacking up a guest list or announcing the theme of the day. When not in use, it looks like an op-art piece, rather than a bulletin board. It comes with all necessary hardware for hanging. Turn a small area in your kitchen or entryway into the quick message board. This little board is simple and white, with a rim that looks as if it has been hole punched from a piece of typing paper. However, this small size message board is made of durable metal. It comes in white, but can be painted with any metal paint. Declare the house rules with an artsy board that has the permanent message that reads, “In this house, we ….” And then leaves space for your messages. Dry erase marker and all hardware needed for hanging is included. Come in a convenient two-foot size. Need something a little more stable for paper notes and other items? You will enjoy this fabric memo board and organizer. Neatly framed in with the beige memo board is a mail holder and three key hooks. You’ll not find a better way to keep everything together than this coordinated set up, ready to hang in your entryway.